Free Shipping Included! 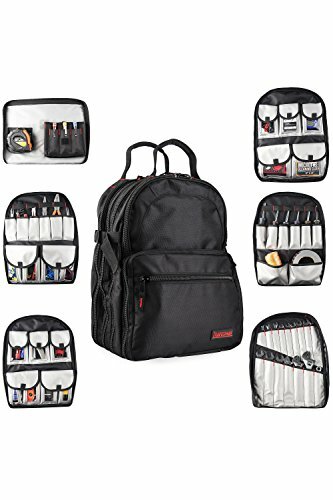 Tradesman Tool Storage Organizer Backpack: Heavy Duty Jobsite Bag with 50+ Pockets for Multiple Tools - Tool Box Backpacks for an Electrician, HVAC Contractor, Carpenter or Construction Work - Black by Tradesman Tool Storage at Defy Now. Hurry! Limited time offer. Offer valid only while supplies last. NEXT GENERATION NOW MORE DURABLE We have taken our customer's feedback and worked with our manufacturing team to reinforce the entire back pack. We have taken our customer's feedback and worked with our manufacturing team to reinforce the entire back pack. This reinforcement has gone through a series of real world tests while completely filled with tools and has held up under the abuse. We are proud to offer this product to our customers and offer a 100% money back guarantee if not completely satisfied with the product so you can purchase with confidence and be assured that the Tradesman team will make it right! We know you work in tough environments with no margin for error, which is why we built our bag to last and never let you down. Its heavy-duty ballistic polyester fabric is strong enough to withstand the rigors of travel and outdoor work, and the zippers are made to be extra durable. Designed with 6 large zippered compartments, the Tradesman Tool Storage backpack keeps everything you need within easy reach. You'll have access to 50+ pockets of various sizes, configurations and closures, allowing you to safely store and transport a variety of tools without damage. It holds multi-piece screwdriver and wrench sets, measuring tape, levels, electric tools and electronic devices, flashlights, rope, and more. Searching through loose tools wastes precious time and poses a serious safety hazard. Our backpacks feature multiple built-in organizers to safely and securely store sharp tools while still keeping them easily accessible. We included see-through holders, sleeves, stretch loops and pockets of all sizes so you can quickly find what you need and finish the job. Tool backpacks are ideal for contractors, carpenters, HVAC service reps, plumbers, electricians, cable installers, and other techs. Transporting your tools between job sites has never been easier! NEXT GENERATION NOW MORE DURABLE We have taken our customer's feedback and worked with our manufacturing team to reinforce the entire back pack. This reinforcement has gone through a series of real world tests while completely filled with tools and has held up under the severe abuse. RUGGED & DURABLE We know you work in tough environments with no margin for error, which is why we built our bag to last and never let you down. Its heavy-duty ballistic polyester fabric is strong enough to withstand the rigors of travel and outdoor work, and the zippers are made to be extra durable. 6 LARGE COMPARTMENTS Designed with 6 large zippered compartments, the Tradesman Tool Storage backpack keeps everything you need within easy reach. You'll have access to 50+ pockets of various sizes, configurations and closures, allowing you to safely store and transport a variety of tools without damage. It holds multi-piece screwdriver and wrench sets, measuring tape, levels, electric tools and electronic devices, flashlights, rope, and more. BUILT IN ORGANIZATION Searching through loose tools wastes precious time and poses a serious safety hazard. Our backpacks feature multiple built-in organizers to safely and securely store sharp tools while still keeping them easily accessible. We included see-through holders, sleeves, stretch loops and pockets of all sizes so you can quickly find what you need and finish the job. FOR ALL TRADES Tool backpacks are ideal for contractors, carpenters, HVAC service reps, plumbers, electricians, cable installers, and other techs. Transporting your tools between job sites has never been easier! If you have any questions about this product by Tradesman Tool Storage, contact us by completing and submitting the form below. If you are looking for a specif part number, please include it with your message.